The date of Earth Overshoot Day is calculated by comparing humanity’s total yearly consumption (Ecological Footprint) with Earth’s capacity to regenerate renewable natural resources in that year (biocapacity). Global Ecological Footprint and biocapacity metrics, in turn, are calculated each year with National Footprint Accounts. Using UN statistics, these accounts incorporate the latest data and the most updated accounting methodology (the National Footprint Accounts 2018 Edition feature 2014 data.) To estimate this year’s Earth Overshoot Day, Ecological Footprint and biocapacity are “nowcasted” to the current year using the latest data from additional sources, such as the Global Carbon Project and others. To maintain consistency with the latest reported data and science, the Ecological Footprint metrics for all past years since 1961 (the earliest year data is available) are recalculated every year, so each year’s metrics share a common data set and the exact same accounting method. The annual dates of Earth Overshoot Day are recalculated accordingly. Consequently, it is inaccurate to simply look at media accounts from previous years to determine past Earth Overshoot Days. 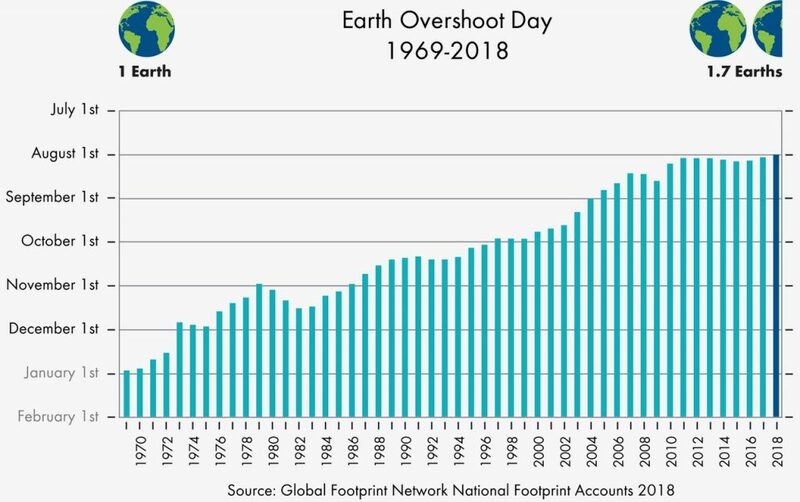 Indeed, a true apples-to-apples comparison of Earth Overshoot Days can only be made using the same edition of the National Footprint Accounts. For instance, it would make no sense to compare the date of Earth Overshoot Day 2007 as it was calculated that year—and reported by the media at the time—with the date of Earth Overshoot Day 2018, because improved historical data and new findings such as lower net carbon sequestration by forests have slightly shifted the results. Even a few percentage points change can shift the date of Earth Overshoot Day by a good number of days. This is why, ultimately, the precise Earth Overshoot Day date for each year is less significant than the sheer magnitude of the ecological overshoot, as well as the overall trend of the date progression year over year—which, as you now understand, is rigorously identical to that of the Ecological Footprint (given the fact that biocapacity remains basically unchanged.) Over the last decades, the date has been creeping up the calendar every year, although at a slowing rate.